Fertile, well drained, and free of persistent weeds. Long-lived hardy perennial. Beds can produce for decades. Mulch with 5cm (2 in) of rich compost or rotted manure every winter. Calendula, Tomato, Marigold and Petunia. Set out dormant 1-year old roots, called crowns, in late winter or early spring. A few varieties can be grown from seed. After the stems die back in early winter, cut them off at ground level and compost them. Remove weeds, apply compost and mulch, and your yearly maintenance is done. Begin gathering spears the second year after planting, cutting all spears that appear for a month in early spring. In subsequent years, harvest for 6 weeks each spring. 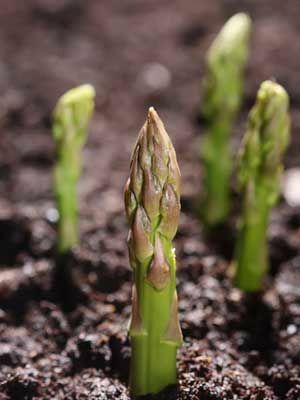 Cutting new shoots just below the surface often helps control problems with asparagus beetles, which often lay their eggs on tender shoots near the soil line.